Location: The First and Last Stop is located in Bowen Sound between Cargill Creek and Fresh Creek on North Andros Island. Time of Year: October through June. 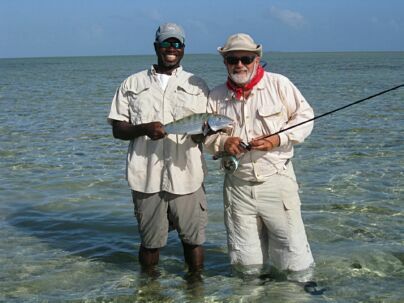 Fishing: If you are interested in diversity of water and variety of species, then Herman Bain is the guide for you. 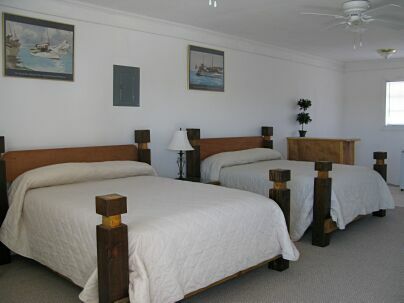 Herman’s lodging is located in the Bowen Sound area, allowing Herman to cover a vast amount of water in search of bonefish, tarpon, permit, barracuda and jacks. With the ability to trailer his boat to any location, Herman guides the Joulters in the north and the North, Middle and South Bights. He also guides the Fresh Creek area and the entire East and West sides of Andros. Depending on the time of year and area you fish, you’ll find schools of hundreds of bonefish, to small pods or even single larger bonefish. Herman also knows prime areas for targeting tarpon and permit; areas like William’s Island to Red Bay and the Joulters. In addition, Herman knows excellent areas for catching barracuda and shark. 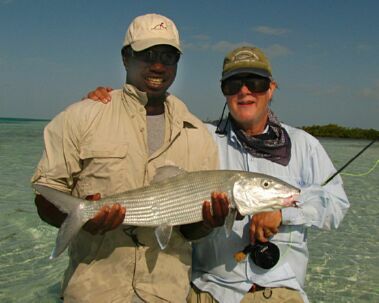 No matter what style of fishing you want to do, whether wade fishing or poling from a boat, no matter what kind of water you want to fish, whether open flats or winding creek systems, no matter what species you want to target, whether bonefish or jacks, Herman has the know how and experience for you to have the best day possible on the water. Herman also offers 2-3 day long camping trips, primarily on the more remote and uninhabited West side. This means that instead of having to turn back and come in at the end of the day, even if the fishing is just picking up or you’re not ready, you can stay out as long as you like. Also, you are able to fish more distant and isolated waters where few anglers have ever ventured. This is truly a unique opportunity on Andros that allows you to see pristine waters at your own pace. Lodge Facility and Accommodations: Herman and Antoinette are gracious, accommodating hosts, whose comfortable and inviting rooms will have you feeling right at home. With a capacity of 6 anglers between four VERY spacious rooms, all are air conditioned with their own private bath, microwave, fridge and cable TV. One of the rooms also features a full kitchenette and walk-in closet. The open air, screened in dining room and kitchen are a separate building where Antoinette’s homemade and very delicious meals are served. One unique advantage to Herman and Antoinette’s place is the small convenience store and gas station located right next door. The store has limited basics with a small selection of food and toiletries, so if you forget your toothbrush or need a quick snack, it’s no further than a few steps away. What’s Included: The prices listed include lodging, guided fishing and all meals. What’s NOT Included: The prices listed do NOT include airfare to and from Andros Town, taxi service to the lodge - round trip (about $40 each way + tip - for up to 6 people), liquor and beverages, tackle or gratuities. How to Get There: From the Andros Town Airport The First and Last Stop is a short 15-minute taxi ride. When flying into Andros Town there are several options. Continental Airlines operated by Gulfstream International, offers flights from Ft. Lauderdale, Florida into Andros Town on Tuesdays and Saturdays. To check on the most recent schedules, or to book a trip, call 1-800-231-0856. Their website is www.gulfstreamair.com. To book a trip online go to www.continental.com. From Nassau, New Providence Island there are twice daily flights (only 15 minutes!) into Andros Town with Western Air. The flights leave at 7:00am and 4:00pm and return at 7:30am and 4:30 pm respectively. Reservations with Western Air can be made at 1-242-377-2222. Their website is www.westernairbahamas.com. Please note that Western Air ONLY accepts cash for payment. When checking in with Western Air in Nassau, you will need $140 in cash, either US or Bahamian ($1 US = $1 Bahamian), to pay for your round-trip ticket. A third option if you are traveling with a group is to hire a private charter. From Ft. Lauderdale, Florida there are many charter companies to work with. Please contact us for more information. 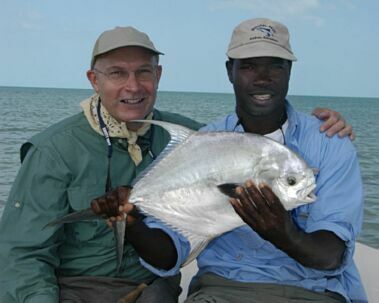 Last Trip Summary: February 26th, 2009 – A KILLER day with Herman – My first Jack Trevally! Today we chose to stay close to home and fish a local creek system near Herman’s place. Heading a considerable way back into the creek, we paused to cast to a few cruising bonefish – a few were interested, but none committed. Continuing to pole along the shoreline, Herman suddenly screamed, “Permit! 12 o’clock, 100 feet!” Sure enough, feeding along the shoreline and heading right for us were two good-sized permit. Having no time to switch rods or flies and still trying to comprehend the fact that I was actually casting to my first permit, I made the cast and my fly landed about 25 feet in front of them. In an INSTANT, one of the permit screamed forward, grabbed my fly and spit it before I could even strike. Dumbfounded, I never would have thought the permit would take the fly as it was still sinking. As it was, everything happened so quickly, it wasn’t until I saw them swimming away that I realized I had just botched my first shot at a permit. I was heartbroken, especially when Herman good-naturedly said, “Do you realize those were at least 25 pound fish?” Boy did I. After I had sufficiently recovered from my loss, Herman took us up a small, winding creek channel where we caught small jacks, mutton snapper and a few barracuda. It was a very neat spot, but after a while Herman said we should head to a different area for bonefish. We agreed and almost immediately after shutting off the motor at our new location we encountered a pod of bonefish. Quickly I made the cast and in a matter of minutes I had hooked and landed a beautiful 5-6 pound fish. After I released it, Herman said, “More fish, 60 feet, 11 o’clock.” I started making false casts and was about to let go when Herman yelled, “No, stop! Don’t cast!” He said there was a ‘big fish’ about 200 yards away and began poling after it. Traveling away from us, we could not tell what the fish was (maybe a tarpon? ), only that it was big and I wanted a go at it. This time, I had a chance to switch rods and put on a shallow water cockroach pattern. As Herman narrowed the gap to about 75 feet, the fish suddenly started boiling and crashing on the surface after baitfish. At this point, I knew I had a good shot at this fish. Casting just slightly aside from where the fish was feeding, it was only a matter of moments before I felt tension and struck. This time success and what a fight! Taking me deep into my backing several times, I finally landed my mystery fish – it was an incredible 30 pound Jack Trevally. I was thrilled, and what a great way to end the day! We had a blast fishing with Herman and will without question be back to fish with him again.